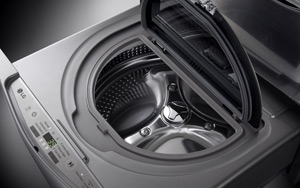 Next month LG Electronics is debuting its Twin Wash machine that will allow users to wash two loads at the same time, something executives proclaim is industry-first technology. Now, LG is raising awareness for this innovation with a multifaceted campaign developed by its agency Hill Holliday. The campaign launched Tuesday with an experiential event in New York City's Times Square area that showcased a larger-than-life “battle” among 16-foot tall puppets vying for position in the washing tubs of a giant-sized version of the new LG machine. Hill Holliday filmed the puppet battle and related content that will roll out on LG’s social platforms throughout the month of November in an effort to "prep the market" and generate buzz for the machine. In January, LG will introduce further elements of the campaign including ads with digitized versions of battling street clothes. One TV spot takes its cue from the Broadway and film classic, “West Side Story.” It depicts “gangs” of anthropomorphic dark clothes and white clothes in a choreographed street battle where they struggle to stay apart (as in washing dark clothes separately from white). Unlike the play and film, where the principal characters end up dead or miserable, the LG spot, being an Adland production, has a happy ending, with a woman being able to wash both her dark and white clothes simultaneously in the dual tub LG washer. "The whole concept starts with the insight that consumers often have small loads that need to be washed separately, because they don’t mix well with other clothing,” says Angela Smith, brand director, LG Home Appliances. “Colors bleed, the fabric is delicate or the clothing just requires special laundry care." Smith credited HH with developing the creative idea that “brings to life this challenge in a fun and unique way. It ultimately demonstrates how the new LG Twin Wash helps families divide and conquer their laundry by washing two loads at once saving you time so that you can focus on more important things in life." This U.S.-only effort is aimed at upscale buyers who seek convenience and can afford this premium priced technology. "As the ultimate multitaskers and people who take pride in a well-run home, our target is constantly seeking out innovative solutions for their household care," says Smith.